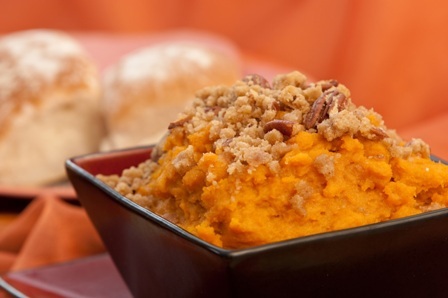 Does your family crave sweet potatoes? Mine sure does. Here is a fabulous recipe for a Basil and Pecan Sweet Potato Bake from Allens.com. I'll be making this recipe for our Easter dinner this year. It looks so easy to make and my mouth waters just looking at the photo. Preheat oven to 350°F. In medium mixing bowl, combine first seven ingredients and blend with an electric mixer or in a food processor. Transfer mixture to a greased 9" x 9" casserole dish and smooth the surface. Top with chopped pecans. Cover and bake 20 minutes; remove cover and bake an additional 10 minutes.